In the last 30 years, childhood obesity has more than tripled, according to the Centers for Disease Control and Prevention. Healthy lifestyle habits, including eating right and exercising, are keys to preventing childhood obesity. 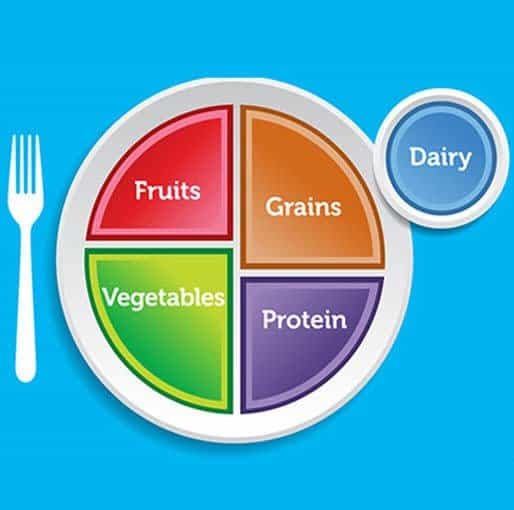 Learning the proper portions of food your child should be consuming can help you serve him healthy, balanced meals. The traditional food pyramid has been phased out, but the U.S. Department of Agriculture designed a program called My Plate to take its place. Children 2 to 3 years of age should consume one cup of fruits per day, children 4 to 8 years old should eat one to 1-1/2 cups of fruit per day, girls ages 9 to 18 years old and boys ages 9 to 13 years old need 1-1/2 cups of fruit per day, and boys ages 14 to 18 years old need 2 cups of fruit per day, according to USDA’s My Plate. Examples of a cup of fruit include a small apple, a medium pear, a small watermelon wedge, and a cup of cubed pineapple. Children 2 to 3 years of age should consume one cup of vegetables per day, children 4 to 8 years old should eat 1-1/2 cups of vegetables per day, girls ages 9 to 13 years old need two cups of vegetables per day, girls ages 14 to 18 years old and boys ages 9 to 13 years old need 2 cups of vegetables per day, and boys 14 to 18 years old should eat three cups of vegetables per day. Examples of what qualifies as a cup of vegetables include two medium carrots, two cups of raw vegetables, and one cup of cooked vegetables. Aim to feed your children a variety of vegetables throughout the course of the week, including dark green leafy vegetables, red and orange vegetables, beans and peas, starchy vegetables, and other types of vegetables. Children 2 to 3 years of age should consume three ounce equivalents of grains per day, children 4 to 8 years old and girls ages 9 to 13 years of age should eat five ounce equivalents of grains per day, girls ages 14 to 18 years old and boys ages 9 to 13 years old need six ounce equivalents of grains per day, and boys ages 14 to 18 years old need eight ounce equivalents of grains per day. Examples of an ounce equivalent include a small bagel, a small biscuit, five whole wheat crackers, and three cups of popped popcorn. Half of your child’s grains should be whole grains. Children 2 to 3 years of age should consume two-ounce equivalents of protein per day, children 4 to 8 years old should eat four-ounce equivalents of protein per day, girls ages 9 to 18 years old and boys ages 9 to 13 years old five-ounce equivalents of protein per day, and boys ages 14 to 18 years old need 6-1/2 ounce equivalents of protein per day. Examples of an ounce equivalent include 1 ounce of cooked chicken, one whole egg; one-quarter cup of tofu; and two tablespoons of hummus. Children 2 to 3 years of age should consume two cups of dairy per day, children 4 to 8 years old should consume 2-1/2 cups of dairy per day, and children ages 9 to 18 years of age need 3 cups of dairy per day. Examples of what counts as a cup of dairy include one cup of milk or calcium-fortified soy milk, one-third cup of shredded cheese, one cup of yogurt, two ounces processed cheese, and two cups cottage cheese. Oils are not regarded as a food group. However, USDA’s My Plate has a daily allowance of various amounts of oils for children of different ages. Children ages 2 to 3 years are permitted three teaspoons of oils a day, children ages 4 to 8 years are allowed four teaspoons of oils a day, girls ages 9 to 18 years and boys ages 9 to 13 years are permitted five teaspoons of oils a day, and boys 14 to 18 years old are allowed six teaspoons of oils a day.